Like most other B2C businesses, you are probably dealing with a huge problem that seems to keep affecting your business – you are unable to get more qualified leads and convert them into loyal customers. Your site visitors simply do not seem interested in what you have to offer, and they leave immediately. This means high bounce rate, low engagement rate, minimal asset consumption and no leads down the funnel. The solution to your problem is simple and straightforward, Develop and Inbound Marketing Strategy. You need to give up using those old and outdated marketing strategies that focus on interrupting the buyer journey and annoying them with intrusive ads. Instead, you should focus on integrating inbound marketing into your digital strategy. You should start to provide real value to your prospects and smooth out their buying journey by incorporating key elements and assets into the discover and learn phases. In simple terms, inbound marketing is defined as a modern approach that enables business owners to attract qualified leads through interactions that are helpful and relevant, not intrusive. In other words, with inbound marketing you are positioning your brand right there in the customer journey, directing them towards your products and services. Some of the channels of inbound marketing are SEO, landing page marketing, social media, call-to-actions and email marketing. Using the four stages of inbound marketing, which are attract, convert, close and delight, you can easily turn prospects that are complete strangers to your business into lifelong customers and even business partners. According to Neil Patel, Guy Kawasaki, and other famous marketers, inbound marketing is the SINGLE MOST IMPORTANT MARKETING TECHNIQUE business owners should focus on in 2017. Indeed, by focusing on inbound marketing and by integrating it into your overall marketing strategy, you can get an edge over your competitors, maximize your reach, minimize costs and skyrocket your presence online. Why Integrate Inbound Marketing into your Strategy? Inbound marketing comes with a whole new approach to marketing, enabling you to stay away from ad blockers. Due to their interruptive nature, ads have become the bane of digital marketing. People simply hate ads. The result – outbound marketing is not as effective as it used to be ten years ago. In fact, outbound marketing can even hurt your chances of converting. On the other hand, inbound marketing does not fight to get your customers attention. Instead, you create tailored content that provides value to the users and solves their problems. This content, when inserted in the right stage of the customer buyer journey, can spike their interest and convince them to choose you over your competitors. With inbound marketing, you rely on earning the interests of your prospects by providing them with something that is of value to them. Whether it’s a blog post, an infographic, white paper, eBook or a try offer, you can use inbound marketing to attract more customers, convert them into leads, close the deal and ultimately delight them. 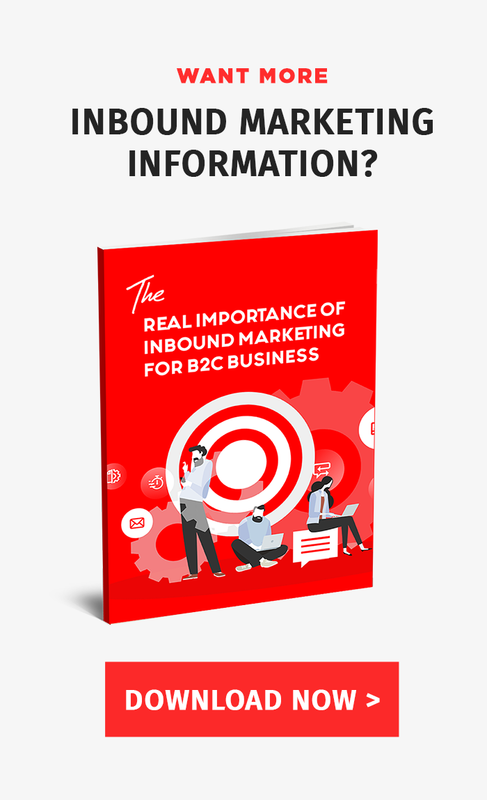 To discover more about the huge importance of inbound marketing and to understand the whole process, we have created a great whitepaper titled: “The Real Importance of Inbound Marketing for B2C Businesses”. You can download it here for free (note: add here your barter – I guess you want their email addresses). Just enter your email address and download this whitepaper that could help solve your problem of unqualified leads once and for all. 1. Attract more people to your site: inbound marketing is all about fine-tuning your presence online. This involves creating targeted content that solves customers problems. You should identify the right set of keywords your prospects are using to find a solution to their problem and ramp up your SEO presence to become visible to customers in the awareness stage. 2. Convert leads: with inbound marketing, you also focus on optimizing your landing page using compelling calls to action. Those unqualified leads become qualified by reading assets and information on your page, so they have more chances to convert and become real customers. 3.Maximize ROI: and last, we all want to maximize our return on investment. Inbound marketing is the best in terms of ROI, being 2.6 times cheaper than outbound marketing and coming with a 3x more ROI.